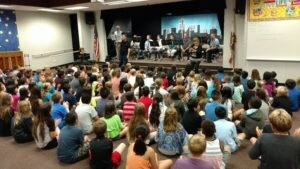 Elementary music instruction is provided to all 4th, 5th and 6th grade students in the Placentia-Yorba Linda Unified School District. Classes are taught during the school day by credentialed music educators in the areas of band, strings and vocal music. Provided on this website is information about your child’s music teacher(s), local music vendors, instrument information, music class schedules and much much more! We look forward to working with your students and expanding their educational experience! Simply scroll down and/or click on a tab on the menu to the right to learn all you need to know about our program. On Monday, September 10, 2018 at 7:00 pm in the Lakeview Elementary School Multi-Purpose room we will have a meeting for all parents of students who are staring either a band or a string instrument for the first time this year. It is a chance to meet your student’s music teacher and find out more information about our program. If you missed the meeting or have any further questions you can contact your student's music teacher through their elementary school or you can visit the music teacher page on this site to get the contact information for your student's music teacher. Each year, the first two weeks of school, our elementary music staff presented an assembly at each of our 21 elementary schools to demonstrate the instruments, tell the students about the program and to let the students know about their options for music class that year! Here is a photo of one of those assemblies! Please click the appropriate PDF below for a printable copy of the of the brochure that was handed out at our elementary music assemblies. This brochure has much of the information you and your student needs for this upcoming year of music classes including the choices your student has at each grade level and much more! If you would like to purchase insurance for the instrument your student is using for our program please click the link below. 5th and 6th grade band students need: Accent on Achievement book 1 by John O’Reilly and Mark Williams. 4th, 5th and 6th grade string students need: All for Strings book 1 by Gerald Anderson and Robert Frost. 6th grade string students also need: All for Strings book 2 by Gerald Anderson and Robert Frost. In addition, all instrumental music students, playing a band or a string instrument, need to have a 1/2 inch 3-ring binder for additional music we hand out in our music classes. You can purchase the method books from our local music retailers or online.